PHNOM PENH, Cambodia, Jan 18 2018 (IPS) - Three friends are relaxing in a quiet courtyard. They speak English with a strong American accent and talk about their disadvantaged neighborhoods. Their tattoos depict a rough life on the street. One of them calls Massachusetts home, while the others grew up in Georgia. But home is far away, on the other side of the world. They have been living in Cambodia for a number of years, against their will. They were deported by the U.S. Immigration and Customs Enforcement (ICE) to their country of origin, one completely unknown to them. Most have no or little knowledge of the Cambodian language, Khmer. These American Cambodians belong to a group of more than 500 ‘deportees’ who have been sent back since 2002. They have lived the biggest part of their lives in the U.S. Their parents fled in the eighties, when Cambodia was torn apart by the genocidal Khmer Rouge and the following civil war. Between 1975 (start of the Khmer Rouge) and 1994 (end of the civil war) 158,000 Cambodians were allowed into the U.S.
“I made bad choices. I was a threat to society. I can’t make no excuses, I can only blame myself.” After Chhean finished his time in prison, he was deported by ICE. Jock recounts what happened to him with disbelief. “I have spent five years in a cell, they thought I was an escape risk. Five years! For a fistfight 20 years ago! 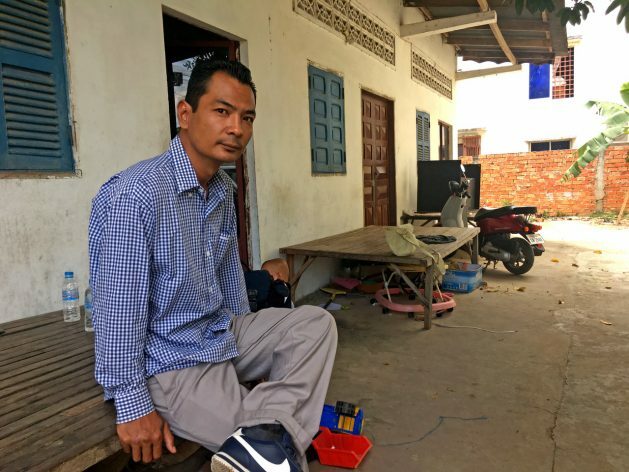 For years I have been begging them: ‘Please deport me’.” His friend Chhean was also incarcerated before his flight to Cambodia, but ‘only’ for two years. The deported Cambodians have trouble finding work. This country has a high rate of unemployment. They speak the local language badly and lack the necessary skills. Cambodia has an agrarian economy, but they are city boys. They are also met with distrust. They dress and behave differently. In Cambodian culture, their tattoos are considered signs of serious crimes. “I worked the first six years in the rice fields. That is simple but hard work. I couldn’t find anything else,” says a deported Cambodian who wishes to stay anonymous. Last year, he acquired a certificate to teach English. He works in a classroom now. The U.S. government wants Cambodia to take back more of its ‘lost’ children. That is required by international law when Cambodians are deported. But the government in Phnom Penh is hesitant. These citizens have no sense of the culture and can never really integrate into society. Some have serious mental illnesses, says Jock. Research by the Leitner Center in New York showed that 62 percent of Cambodian refugees in California suffered from post-traumatic stress disorder (PTSD). Fifty-two percent had severe depression. Many were in a state of shock and not able to take care of themselves or their children. They ended up in poor neighborhoods where crime was the norm. For these specific circumstances, psychiatrists and lawyers say that refugees from Cambodia deserve special treatment. But President Donald Trump wants to increase the deportations. Some 1,900 are eligible for deportation, says ICE. In the “Kingdom of Wonder” – as Cambodians call their country – many refugees who return are confronted with alcohol and drug abuse. Many suffer from depression, and at least six deported Cambodians have committed suicide. Once deported, there is no way back. They can never visit the country where they grew up ever again. “Hell yeah! I would go back immediately if I could. Not tomorrow but today,” shouts Chhean jokingly. *Last names omitted to protect the sources’ privacy.